Ernest Hemingway was once asked how it is that entities goes bankrupt? And he responded, "very slowly, then all at once." That quote perfectly summarizes the current bankruptcy process of many government entities around the world. This past week the "all at once" occurred in the city of Detroit when they entered Chapter 9. Before we discuss the negative aspects of the municipal bond market I'd like to first review the positives. There are 90,000 municipalities in the United States. For perspective on the size of that number, there are only 6,000 U.S. stocks (and 1,000 ETFs). Each individual municipality, just like each individual stock, has its own balance sheet, economic outlook, and story. Few analysts take the time to look in depth at the accounting of individual municipalities, while there are thousands and thousands of analysts looking over the accounting of stocks. Municipalities tend to get "lumped together" which is unfair because while many will go bankrupt over the next few years, most are healthy investments (in terms of default risk). Only 61 local governments have gone through Chapter 9 since 1954. The municipal bond market trouble that is coming will not shake the financial system the way the housing market did back in 2008 because it is only $3.7 trillion in size vs. the $14 trillion mortgage market back then. 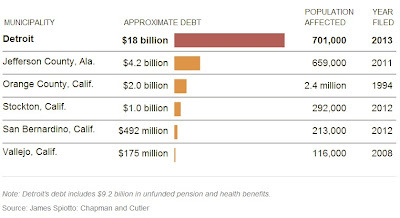 Only a small part of that $3.7 trillion is in major danger. The most important part of this event, for those living outside of Detroit, will be the legal battle that will take place in the courtrooms regarding how bond holders, unionized government workers, and pensions are handled. Many troubled municipalities have made promises that they simply will be unable to keep in the years ahead. When the unions do not renegotiate the terms, the only (and best) option for the city is bankruptcy. 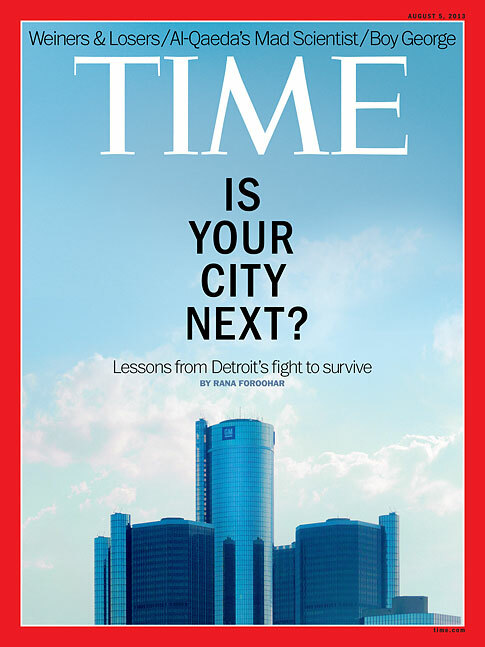 I will not even guess how the Detroit situation will play out because I have no idea how. It will be important to follow because it will set the precedent that will be used as the blue print for the rest of the country. We know, as of this writing, that bankruptcy Judge Steven Rhodes has blocked lawsuits by public employees and pension funds. 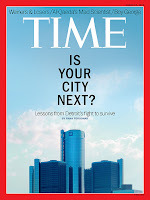 The Detroit bankruptcy will have other ramifications, one being that it will trigger an avalanche of ratings downgrades. Other major cities to keep an eye on in the months ahead are Philadelphia, Houston, LA, New York City, Baltimore, Miami, and Chicago. Due to their financial troubles, the Detroit bankruptcy will cause the ratings agencies to re-evaluate their current credit ratings. Lower credit ratings brings less demand for bonds and higher interest payments. This only compounds the problems because their borrowing costs will rise when they need capital the most. The following shows money moving out of muni bond funds in late May, and unlike other debt markets, the money has not yet returned. 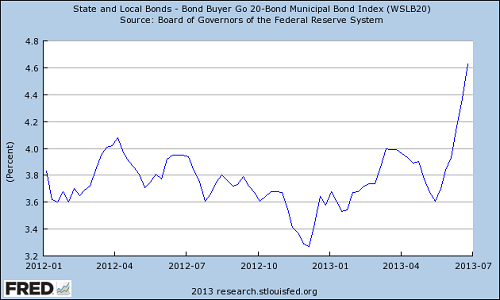 This highlights the dangers of general bond funds or mutual funds. Investors up until recently have been pouring money into these securities unaware that they are laced with toxic muni debt that has only survived due to the artificially low interest rate environment. How cities got into so much trouble can be summed up quickly and easily: The cities that experienced the greatest home price appreciation during the bubble priced in the increase in real estate taxes into their models. 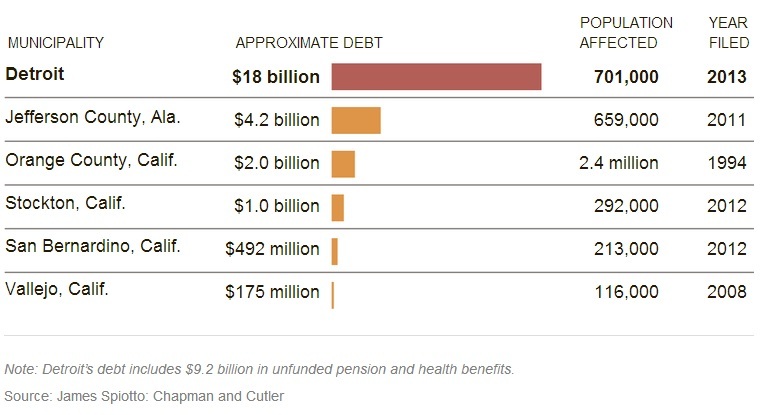 They created bloated spending programs and locked in pension and employment payment programs at astronomically high levels. 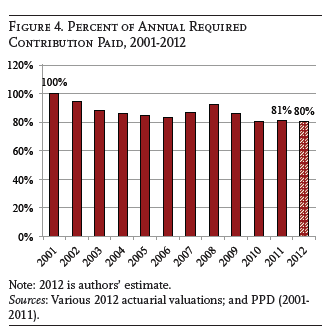 These pension programs have been underfunded and used as a piggy bank since the turn of the new century. Then home prices collapsed, along with many of their economies, and the revenue source disappeared. They have been helped by the federal government and the fortunate timing of our current bond bubble to stay alive. While the real estate bust has been the culprit for most of the market's woes, some cities face additional problems such as a major employer leaving which reduces demand for workers. This then leads to a population decline in that city. 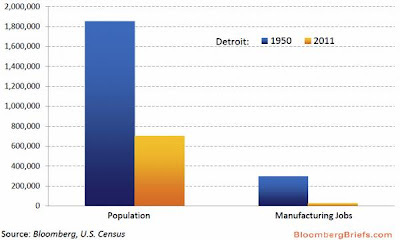 Detroit is a perfect example with their manufacturing industry decimated over the last 60 years. This market will create investment opportunity during the coming debt crisis. Many of these municipalities actually have a fundamentally stronger balance sheet than the federal government. Actually, most do. As the bond market continues to deteriorate and rates rise there could be a panic in the municipal market as more and more local governments turn toward bankruptcy. Many of the stronger cities may see a severe decline in bond prices, allowing the astute investor the opportunity to pick up some great bargains. We are well away fromm that point, but it is something to begin researching now (with a financial professional) as part of your shopping list for when the real crises arrives. While she has become the focus of negativity around the municipal market, anyone who has taken the time to read her work understands that she sees the coming changes as an economic growth opportunity for many areas of the United States. As companies, jobs, and workers leave the most indebted states they will migrate to the states where they are less taxed and have less regulation. Actually, It is a great pleasurable and informational website about financial market. It is very useful site for us So, I like it very much. Thank's so much for published this website. For more information stock screener to visit stock screener This actually also provides a thorough specialized say, regular along with poors account balance linen, intra-day planning along with the corporate information too. This mixture for offers may make the Stock Screener the most profitable screener available.